Palladium topped $1,600 an ounce for the first time, and there’s little sign of the rally slowing as global supply tightens. The price of the metal -- mainly used in autocatalysts in gasoline vehicles -- has almost doubled from a recent low in August. Demand has remained robust as manufacturers scramble to get hold of palladium to meet more stringent emissions controls, particularly in China, even as auto sales in key markets slow. 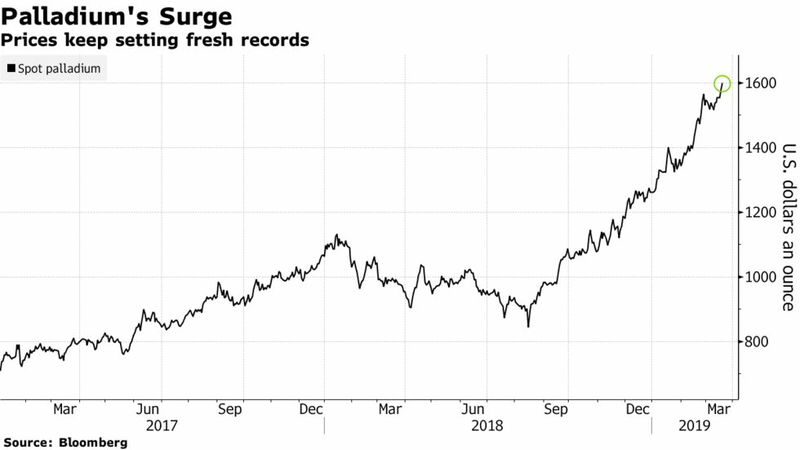 With the palladium market expected to be in deficit for an eighth year, speculators have piled back in, and a robust borrowing market for the metal prompted investors to pull supplies from exchange-traded funds and lease them out. Fiat Chrysler Automobiles NV’s recent recall of about 863,000 vehicles that violate U.S. standards could spur even more demand.